MILBERT - Lake George and the village of Caldwell. . . N°24. MILBERT, J. - Lake George and the village of Caldwell. . . N°24. Lake George and the village of Caldwell. . . N°24. - MILBERT, J. Title : Lake George and the village of Caldwell. . . N°24.. Size : 9.6 x 11.8 inches. / 24.5 x 30.0 cm. 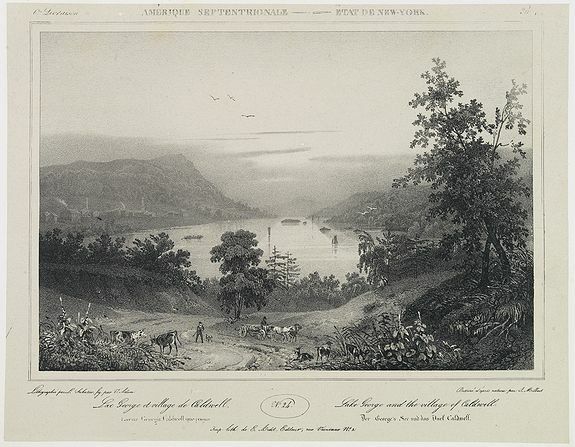 Description :A view of Lake George and the village of Caldwell. From 6e Livraison Amérique Septentrionale - Etat de New York. After Jacques Milbert and lithographed by L. Sabatier, the figures by V. Adam. Printed by E. Ardit rue Vivienne n°2..